The Netherlands, possibly Haarlem, 1496. 18th-century Dutch red morocco over board, gilt, silver clasps, catches, and corner pieces. Made in 1496 probably for the woman represented on folio 78, initials S and K on folio 64; Alfred Barmore Maclay, New York; E. Clark Stillman Collection. 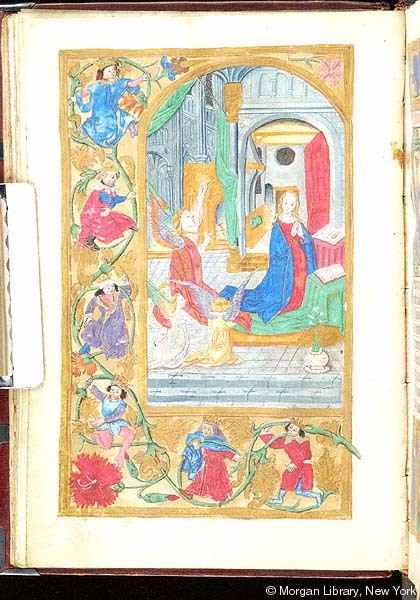 Ms. book of hours, use of the Augustinian Canons of the Windesheim Chapter (Hours of the Virgin, Hours of the Eternal Wisdom, Short Hours of the Cross, Office of the Dead), calendar for Utrecht; written and illuminated in the Netherlands, possibly Haarlem, dated 1496. Decoration: 7 full-page (inserted) miniatures, 38 historiated initials, 2 historiated borders, 16 historiated marginal illustrations. Artist: Spierinck (signed and dated 1496 on fols. 18, 74, 78, 125), possibly Sybrant or Jan.